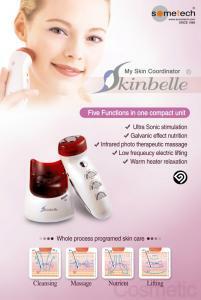 Skinbelle is one of the most advanced personal devices assuring you to clean, massage, supply your skin with valuable nutrition and rejuvenate your face in a privacy of your home. 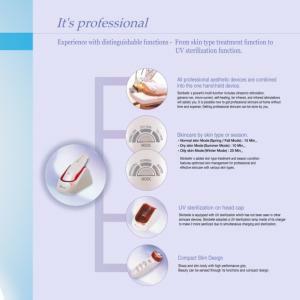 Ultrasonic micro vibration can reach the subcutaneous tissue, remove all residues, wastes and pollutants in deep skin. Alkaline component on anode electrode can dissemble sebum and it is effective to remove skin wastes. Heating stimulation can promote blood circulations and metabolisms. It also increases the removal of impurities and wastes. It makes healthy skin through deep skin heating and promotes blood and lymph circulation. Micro-massage which reach to cell can activate skin by muscle relaxation. It works on melanin of basal layer of epidermis and makes dark skin brighter. It improves skin whitening effect through penetration of nutrition cream containing vitamin C into the deep skin. Promotion of metabolism and blood circulation by infrared laser and heating effects can supply oxygen and nutrients which are required for skin muscle activity. Smooth low frequency micro current makes skin elasticity by repeating contraction and relaxation of muscle. Speed up the metabolism of cell with the infrared stimulation and phototherapy stimulation, make activate the collagen cell. Galvanic (+) ion stimulation makes skin elasticity with acidic effect. To assure your own Skinbelle you can order it online and we will send it to your adress. The price for the EU and the region of Adriatic is EUR 220 - and the transport cost is as low as 10 EUR. That is 230 EUR only !! No need to go to the expensive clinic for a face treatment. No more fuss and no extra costs.